I must say I am lucky to have settled upon a unique calling, wine writing, 30 years ago. Had I not chosen it, a decision that came after interviewing Gino Veronelli in 1983, I would have missed not just a great number of good to great wines (and many more lackluster), but also meeting a tremendous number of fascinating people, people of the sort who warm the heart and give a sense to life  the many people who make the world of wine  in spite of everything else  unique. I was thinking about this on Sunday February 17, in the enchanting setting of one of the world's most beautiful towns, San Gimignano, and its most magical spot, the hilltop that hosts Montenidoli. For it is here that a great, determined, and courageous woman, Elisabetta Fagiuoli, and the lucky man who was her companion for 45 years, Sergio Muratori, didn't just produce great vins de terroir (and what a unique terroir! ), wine of absolute purity, but also showed how making wine can become an expression of love for the land and for life, an expression of culture, and poetry. The heart of this wine, whose label proudly says Sono Montenidoli to remind all that it is the direct expression and child of this land, is one of the traditional complementary grapes of Chianti, Canaiuolo, which, as Daniele Cernilli says in his fascinating book on the Varietals of the world (Edizioni La Conchiglia, Capri), appears to derive its name from the Latin caniculares dies, the hot summer days in which the grapes change color. Elisabetta and Sergio selected these grapes, which have the perfumes of a white, and the color and delicate well delineated substance of a red, for an exceptional rosé, which I consider to be one of the top five  what am I saying, make that three  Italian rosés. A free-run must that ferments at length and is bottles as soon as the sugars have all been transformed, to maintain its freshness, and when you drink it for the first time you fall in love with it. As happens occasionally with special, unique women who transform the inertia of one's existence, conquering with their elegance and strength, and with an absolute charm that is grace, delicacy and will. 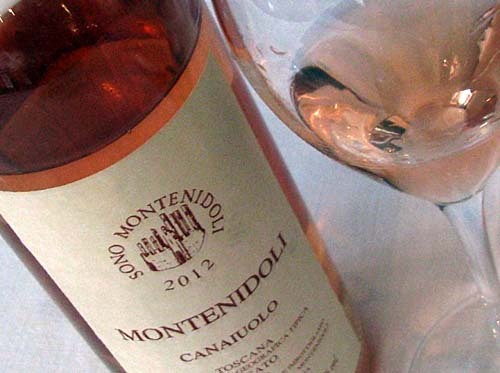 One can quickly summarize this 2012 Canaiuolo rosato: an enoic masterpiece that combines fragrance, harmony, richness of aromas, and cleanliness of expression with terrific enjoyability, like all great works that communicate through the language of simplicity, which becomes truth. Pale forest pink (this year, because of the extreme temperatures, Elisabetta says it is slightly darker than usual barely faded delicate pastel cipria hue), almost light salmon, and brilliant, with a bouquet that's a dance of aromas in chiaroscuro: roses, wild forest berry fruit, freshly cut apple, aromatic herbs, citrus, and then sea salt and abundant flint, and lots of white blossoms, forming a precious, ineffabile, whole of natural and unreachable elegance. A rich but never overbearing nose, one that is suave and intense, with a great many facets laughing as they chase each other in the glass. Ample, to capture all the aromas. Just one sip leads to a coup de foudre, falling hopelessly in love: Juicy crunchy freshly picked fruit, good acidity, and nervous persistence, and at the same time almost immaterial, ineffabile, with the light consistency of a dream, thans to terriffic savory accents, magnificent vibrant acidity, and absolute minerality that confers vibrancy to the wine, infinite energy, and astonishing balance. With that slight bitter almond in the finish that confers yet another dimension, a frame of well calibrated freshness and depth, to an already memorable wine. A wine that envelops, like true friendship, like the embrace of the woman (or man) you carry and will always carry in your heart.